From the very good 1983 vintage, this port is sweet and soft with a plummy taste and a spicy finish. Drink now - 2020. A super anniversary gift. 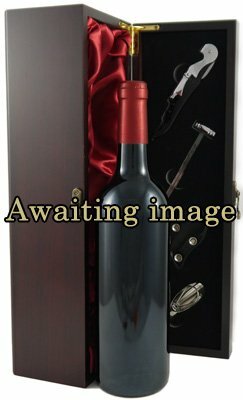 This vintage port is shipped in a deluxe silk lined wooden presentation box with four wine accessories (corkscrew, wine pourer, drip stopper & wine thermometer) [worth £17.99] at no extra cost. Not currently available to buy but can be sourced by our Wine Buyer as a special request. Please call 020 8746 7771 to enquire. Please note the price quoted is only an approximate price and is subject to change. You will be sent a quotation and condition report before you need to make a binding purchase. A very good Vintage Port year producing very muscular Vintage Ports with a great capacity for ageing. Michael Symington of the Symington Port Group which owns the well known names as W&J Graham Vintage Port, Dow Vintage Port and Warre Vintage Port, stated, "our own impression is that certainly above-average wines have been made throughout the Upper Douro and we are sure that some will prove to be outstanding... the fresh nose of the fermenting musts was most noticeable and reminded one to the similar lovely fermenting nose of the 1977s and 1980s... the overall production of the Douro region is some 20-25% down on last year."